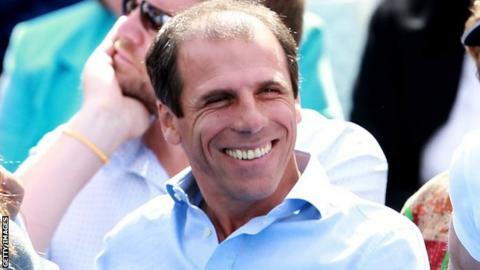 Former West Ham boss Gianfranco Zola has been confirmed as the new manager of Championship side Watford. The 45-year-old has signed a two-year deal to replace Sean Dyche, who was sacked by new owners the Pozzo family. Zola was in charge of West Ham from 2008-2010 after an illustrious playing career in which he made over 300 appearances for Chelsea. He is the second Italian to manage Watford, Gianluca Vialli having been in charge for the 2001-02 season. The Pozzos, who also own Italian Serie A side Udinese and Spanish club Granada, were quick to open negotiations with Zola after completing a deal last Friday to buy the Hornets. Watford's newly-appointed technical director Gianluca Nani told the club website: "Everyone knows how Gianfranco Zola likes football to be played. "I think Watford's fans can expect an exciting and attacking style from his team. Gianfranco represents this project perfectly." Former West Ham chief executive Scott Duxbury was involved in setting up the deal and will join the staff at Vicarage Road in the same role after having a close working relationship with Zola at Upton Park. The Pozzos have already outlined a double ambition of taking the club back to the Premier League and making the Hornets financially self-sufficient. They also plan to use what they describe as their "world-class scouting network" to bring new talent to the club, but insist they will not harm Watford's distinctive identity. It followed concerns recently expressed by the Watford Supporters' Trust that the club could be used as a platform to give experience to Italian youngsters.